An argument hewn from ice! This is an argument hewn from ice… a substance that offers solidity and occasional clarity. But it is also an argument about the absence of ice – meaning nothing less than clear water, with all the plain sailing that implies. 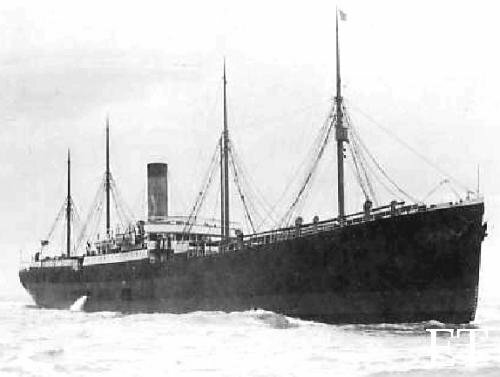 The Leyland liner Californian was effectively named by official Inquiries in 1912 as the vessel seen from the sinking Titanic. That craft was seen at a mean distance of 5.6 miles by Titanic evidence, and estimated at 5 miles or less by Titanic officers. Professional navigational officers instinctively know their own horizon, and this vessel is testified to have approached within middle distance. We now know where the Titanic sank. She lies three miles south of the New York track in latitude 41° 43’ N. Her famous SOS transmission, which was in error longitudinally, specified a latitude of 41° 46’ N.
The Californian on the other hand was bound for Boston, on a track that led along the latitude line of 42° 05’ N. This is fully 19 nautical miles from the Titanic latitude (41° 46’ N) on the north-south axis. 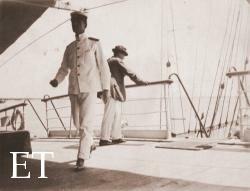 There can no longer be any question, therefore, of the Titanic journeying towards the Boston-bound liner, as Californian Third Officer Charles Victor Groves believed she must have done. Captain Lord and officers of the Anglo-Saxon. Groves trusted implicitly in his own ship’s position (“bound to be accurate if the Captain put it in;” Br 8425), which he had personally helped to guarantee as Officer of the Watch, overseeing her course, before his ship stopped on the night of April 14, 1912.
follows that the vessel which you saw could not have been the Titanic? The wreck on the seabed proves conclusively that the Titanic was on her correct latitude line for New York, because the debris field lies substantially south of it. The only remaining possibility, if the Californian is to be the mystery ship seen from the Titanic, is for the Californian to have broken off her line for Boston, and to have headed towards the Titanic, turning that 19-mile north/south separation into just five. It will be seen that this indulges the theory that the Titanic had to be facing north after her iceberg impact (encountered when heading west!) and after subsequent attempts to “resume her course,” as Lawrence Beesley puts it. It is necessary, among Californian-accusers, for the Titanic to be assumed pointing her bows to the north when all engines are finally stilled. Only in such a scenario can the Californian be painted as the mystery ship, the latter vessel being indisputably seen off the port bow of the Titanic, indeed almost directly in front of her. Allowing this assumption (for the sake of argument) means placing the mystery ship an appropriate five miles north of the Titanic’s 41° 46’ latitude, in accordance with the evidence of those on board that vessel. The mystery ship then occupies a latitude of 41° 51’ N. Indeed it must be here, if those who say the Titanic ended up facing north are correct. The longitude of the wreck site is 49° 56’ W, which gives us a point on the westerly axis. The vast bulk of Titanic’s post-impact drift was southerly, and there is no reason why the wreck site longitude should not also give us a near-enough longitude for the mystery ship. So the mystery ship, when seen from the Titanic, was in 41° 51’ N, 49° 56’ W.
That’s the spot the Californian must reach if she is to be the Titanic’s near visitor! ship's surgeon aboard the NDL Frankfurt. IT is necessary here, before building further, to rehearse some argument from Mystery Ship Made Simple, an earlier article on this site. It deals with the importance of a position for the Californian that was transmitted earlier on the fatal night, heard and logged by Titanic and other ships, and sent out before any vessel got into difficulties. This wireless message was broadcast by Californian at around 7.30pm her time. It related to a sighting an hour earlier, at 6.30pm on the Californian. It took the form of an ice warning to other shipping, and included the Californian’s position at the relevant time. The Californian had been steaming west at 11 knots. Boston lies above the line of 42° N (actually in 42° 21’ N), and a Boston-bound steamer would have no reason whatever to go below this line. 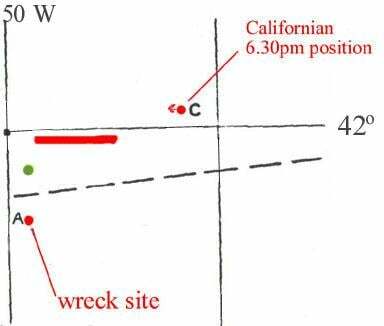 When the Californian stopped at 10.21pm that night, she recorded her position as 42° 05’ N, 50° 07’ W. This is a spot 43 nautical miles from where she was by dead reckoning at 6.30pm. Four hours of steaming at 11 knots, her highest ordinary speed, gives 44 nautical miles travelled. A mileage of 43 is almost exactly right for a vessel that stopped nine minutes short of four hours. 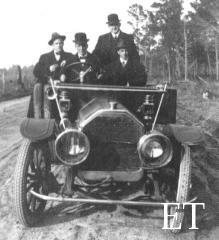 The Californian did not slacken speed – thus, it can be reasoned, there must have been nothing to cause her to do so. She was not troubled by ice for those four hours. Letter sent by the Leyland Line to the British Inquiry, pointing out that the Californian's claimed stop position was consistent with pre-accident wireless transmissions, showing she was on course to Boston. No new wireless report about ice from the Californian for four hours indicates most strongly that she held her course to the West — staying north. If anything had caused her to deviate from her course, the only imaginable cause being ice, then she would have presumably sent a wireless about it, as she had done earlier. This inference is further strengthened by the fact that she did send another wireless warning about the presence of ice when finally confronted by it. So where is the evidence, or the motivation, for the Californian to have headed in any way south? Leaving aside that sheer unlikelihood, and the fact that no-one on the Californian spoke about an altered course, especially not officer Groves, let’s try to get the Californian to the mystery ship spot (41° 51’ N, 49° 56’ W) anyway. The reality is that with 43 miles steamed, she could have reached there. The distance to where the Titanic was later sinking is 41 nautical miles, but the distance to where the mystery ship would have been seen – if Titanic was pointing her bows to the north at this time – is 37 miles. The Californian could have got there, but would have had to alter her course sharply to the southwest, and almost immediately after 6.30pm when she transmitted her earlier position. This is the diagonal she must make – from the more northern and eastern position to a southern and western one. And the great difficulty with sending her there comes down to just one deadly issue: ice. Ice reports had been coming in all day, showing large numbers of hazards in the box bordered by Latitude 41° and 42°, and Longitude 49° and 50°. This is the last insurmountable difficulty with sending the Californian southwest, whether for any reason or no reason. Ice would have intervened. This chart, drawn up by US Naval Hydrographer Captain John Knapp, shows the problem. It shows all the ice reported to his office for April 14, 1912. The dotted line represents what Knapp imagined the Titanic course line to be. It is north of here that the mystery ship was seen, if the preferred theory of Californian-accusers is indulged. The jumble of ice south of line 42° N, compared with a relative absence of ice above 42° N, can at once be seen. It implies that the Californian, sent whimsically on a diagonal SW course from her 6.30pm position, would certainly have encountered ice. Even if not blocked directly by ice, she would have seen it at close quarters – and would therefore have reported it to other shipping by wireless. No ship is in trouble yet; and the Californian has shown herself assiduous at warning others. Furthermore, on seeing extensive ice, the likelihood in such a scenario is that the Californian (finding herself “guessing wrong” by going to the SW), would have reduced her speed quite significantly. Even if she could thread the needle, therefore, the concept of her continuing at operational top speed of 11 knots is redundant. If she cuts speed to half-ahead even as late as two hours into this near four-hour run until she broadcast her stop, the Californian will have travelled 2 x11 (22), plus 2 x 5.5 (11) = 33. It’s not enough to reach the mystery ship position. 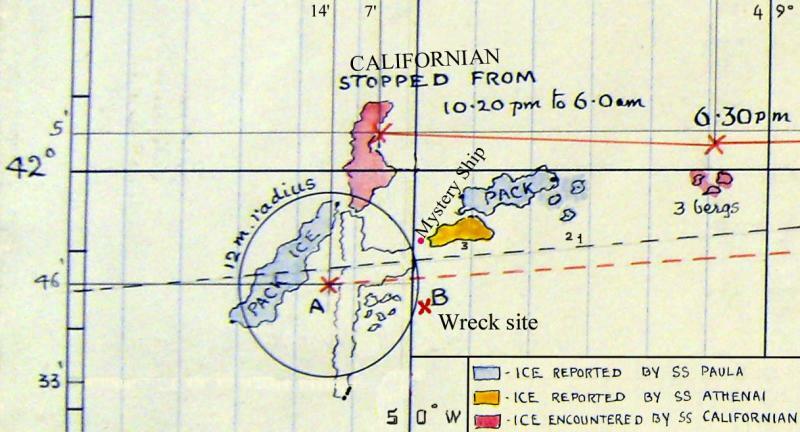 No intermediate ice reports from Californian, added to not enough speed even if ice was threaded through, argue against a descent below 42° N.
The distance from the testified Californian overnight stop position (42° 05 N, 50° 07’ W) to the mystery ship position assumed in this article is 16 nautical miles. That is an hour and a half’s steaming for the Californian after she has broadcast the fact of her being stopped at around 11pm her time. But the sheer unlikelihood of her getting underway again, after she has stopped, is destroyed by the fact that no-one on the Californian suggested for a moment that the vessel renewed engine movement before daylight. Even if we were to assume instead that the Californian continued steaming West until she reached the precise longitude of the Titanic seabed wreck, and only at that point made a 90 degree turn to port to head south to the assumed mystery ship position, there are problems. Such a course would keep the Californian above 42° N, thereby avoiding reported ice in the ‘box’ below, and require her to work her way south after encountering ice (which she would choose this time not to report) in the exact longitude of 49° 56’ W.
This gives the Californian 35 miles of westward progress since 6.30pm, but the distance to the assumed mystery ship spot, on making that hypothetical 90-degree turn to the south, is a further 14 miles. That’s a total of 49 miles. The Californian could only ever have done 43 or 44 miles in the near four hours from 6.30pm until she stopped at 10.21pm, both times according to her clock. Even in this dog-leg scenario, she simply can’t reach the required location. This is a map prepared by A. M. Foweraker, an early – and amateur - sceptic of the official version of events, in 1912. Foweraker was a lawyer, but is better known today for his watercolours. 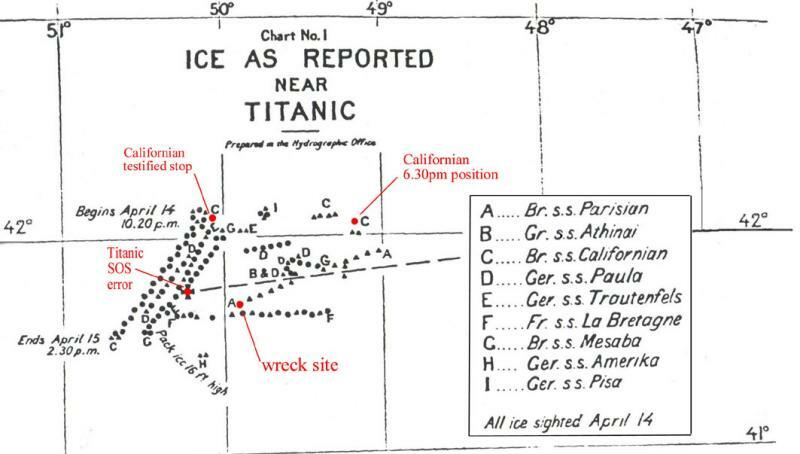 The map shows ice reported by both the German oil tanker Paula and the Greek steamer Athinai (also rendered Athenai) , as well as the Californian’s transmitted 6.30pm position and her testified stop position, both above the line of 42° N.
The official SOS position is shown at (A), and the author of the present article has added the now-known Titanic wreck position (B), as well as that deduced position for the mystery ship in the assumed scenario. The black dotted line shows Knapp’s assumed course of the Titanic; and the red dotted one the more likely course that Foweraker extrapolated from evidence of a delayed Titanic turn at the ‘corner.’ This article makes use of the Knapp line – since a slightly more southerly mystery ship position would be even harder for the Californian to achieve. April 14, forenoon, from latitude 41° 58', longitude 49° 30' W. until 41° 56', 49° 52' - heavy pack ice (one field). The Paula is reporting a field of heavy pack ice that is two miles “high” (in latitude, probably as far as her Master can see), and no fewer than 16 nautical miles long (22 minutes of longitude in this location). That ice will have drifted slowly further east from the forenoon to the evening, and could be eight to ten miles further east by the time the Californian is “diverted” SW in order to fulfil her condemned role in the mystery ship position. In other words, the band of heavy Paula pack ice, shown red below in its before-noon position, would effectively deny any diagonal to the Californian. She can’t get through – would have stopped, and would have transmitted early that she was ‘stopped, surrounded by ice’ as she later did in reality. The green spot, above, represents the assumed mystery ship position. Clearly the sheer mass of ice would have made it extremely difficult to reach. 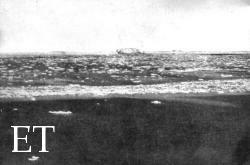 Samuel Halpern, in a research article on this site, has laid stress on the probability of the Titanic encountering ice in the southern box. From ice reports, the probability appears even greater for a vessel entering diagonally from the north. Ignoring the lack of motive or impulse for the Californian to seek to go southwest or south in any case, what cannot be ignored is her knowledge of a lot of ice to her southward – making such a journey all the more unlikely, in that it was known to be much more hazardous than remaining on her existing course. Lord: Well we had had a report of this ice three or four days before, so we were just taking the extra precautions. Senator Smith: You had had reports of this ice? - Yes, sir. Two or three days before? - Yes. Senator Smith: From whom had you received those reports? - From Capt. Barr, of the Caronia, on the 13th of April. That was the day before. Captain Lord cites 'numerous ice reports' that day in an article in the Savannah Morning News published in March 1914. Courtesy of the author. Lord’s innate caution can be seen. He is taking “extra precautions.” He has personally seen ice to his southward, and is worried about encountering ice after dark. In such circumstances, he is hardly likely to contemplate, never mind actually risk, a full-speed southwesterly plunge. Lord had received a report from the Parisian of ice in the southern box on April 14, he testified, and a similar (but days earlier) one from the Nieuw Amsterdam. Parisian Captain William Hains told the US hydrographic office (and presumably told Captain Lord’s vessel) of encountering “medium and large icebergs and numerous growlers” across almost the entire width of the southern box, from 4.30pm to 8pm, a key timeframe. They were in latitude 41° 42’ to 41° 55' N., a band with a “height” of 13 miles. It was all south of Captain Lord’s latitude and course above the line of 42° N. So why enter it? The Californian PV was never read into the record, so we cannot be sure of the totality of ice reports she received, or whether all were even passed on to the Master. However her Captain appears to have been sufficiently aware of them to know that any deviation of course to the south or southwest, especially after dark, would have been sheer folly. Nor is there any conceivable navigational reason to enter the heavier ice region – she was clear of the bulk of it, and was only halted by the general ice barrier at 10.21pm. She would certainly not get to Boston quicker by diverting towards the New York track, and would always have to get back above 42° N.
Captain Lord at the wheel, surrounded by friends. He personally took the wheel to avoid ice in the late evening. Any sharp course diversion by the Leyland liner would have required his express command. And even if Captain Lord had known absolutely nothing of any ice reports, a decision to enter the southern box would likely have been swiftly answered by formidable icy obstruction – however surprising to a skipper unaware of prior warnings. Yet she did not report any ice until after she had stopped (past 50° longitude by her own evidence, and above 42° N.) long into the evening. That is clear evidence in itself. And even if the testified stop position is disregarded, the 10.21pm stop time cannot be. 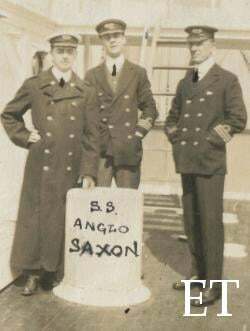 The mystery ship had “beautiful lights,” in the phrase of Officer Boxhall, who later spoke of seeing a line of her portholes. That ship was near – so near that the Titanic energetically flashed her Morse lamp towards her. We may place the Titanic to face north, as anyone may like, but Titanic testimony as to a five mile separation must be held (even if officers Lowe and Pitman offered four miles and two miles respectively at the 1913 court case Ryan v. OSNC). It is their mystery ship, after all. As to the question of whether the Californian could or would have reached the assumed mystery ship spot… Does it really now need to be asked?